Drain chickpeas, saving the liquid (known as aquafaba, literally ‘bean water’) in a bowl. Add salt, confectioner’s sugar, and vanilla extract to the chickpea water and beat on high for approx. 10 min. Set aside. Add dark chocolate to a heatproof bowl and set over a pot of simmering water. Melt chocolate, stirring, then remove from heat and let cool to room temperature. Fold beaten aquafaba into cooled melted chocolate. Add maple syrup and carefully stir to combine. Fill mixture into glasses and refrigerate overnight. 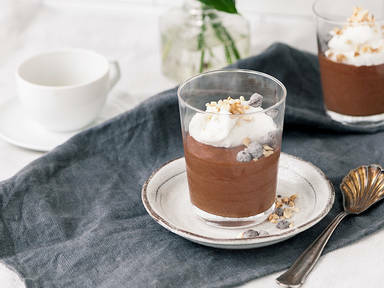 Serve chocolate mousse with whipped coconut cream and garnish with chocolate chips, coconut chips, and chopped hazelnuts. Enjoy!